The Wright flyer was the world's first powered airplane, built and designed by Ohioans Wilbur and Orville Wright in Dayton. It's part of Ohio's proud heritage as the birthplace of aviation, but what does the state's future hold as an aviation hub? The Ohio Aerospace Institute is a consortium of Ohio universities and federally funded research labs. OAI sponsors research at NASA Glenn and at Wright Patterson Airforce Base. The view from John Sankovic's third floor office window into the airy atrium of the Ohio Aerospace Institute is a reminder of his mission there. 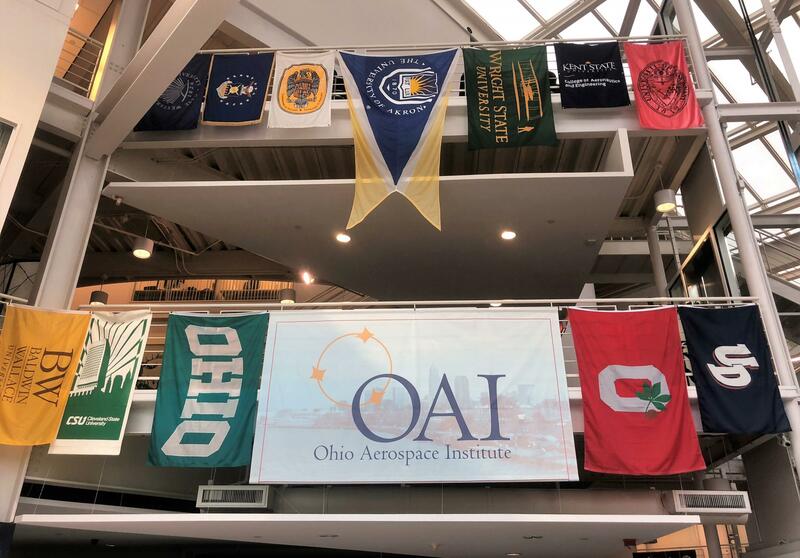 Flags from the ten founding universities proudly hang in the atrium of the Ohio Aerospace Institute in Brook Park. On the left hangs banners from the Institute’s 10 founding universities, representing the schools that, three decades ago, established the non-profit R&D center. On the right, a long list of aerospace industry members wrap around the rim of the atrium. Sankovic spent 31 years at nearby NASA Glenn Research Center, running several research programs, and most recently, as Chief Technologist and head of tech transfer. But in September, Sankovic took over as president and CEO of the aerospace institute. 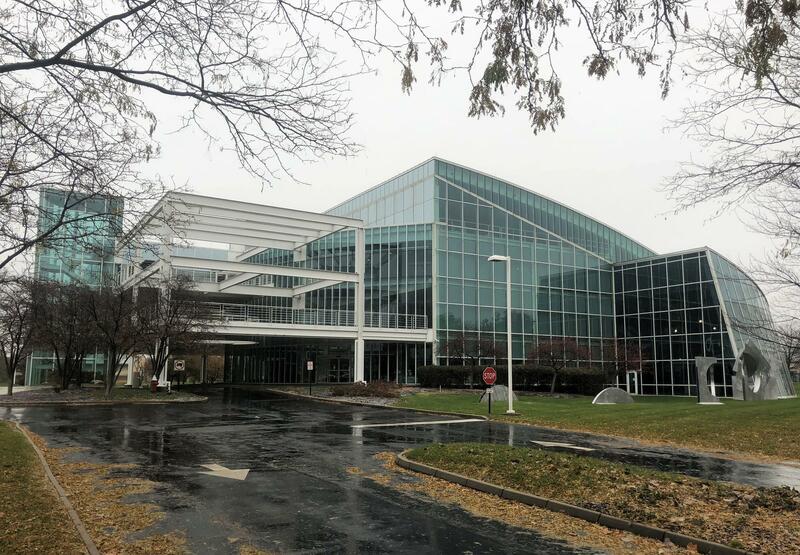 Its ultra-modern headquarters sits just outside the western gates of NASA Glenn and near the runways of Cleveland Hopkins International Airport. The building is all windows, with views of trees and grassy fields — something Sankovic would like to change. “Hopefully outside this window we’ll be seeing a lot more businesses and a lot more aerospace startups,” Sankovic says. Revenue for the Ohio Aerospace Institute’s $14 million budget is split almost evenly between NASA and the U.S. Air Force’s research arm, along with membership fees from industry partners. John Sankovic is the new president and CEO of the Ohio Aerospace Institute. He's looking to bring innovations out of the research labs and into the marketplace through Ohio investments. It uses that money to sponsor research in advanced materials and more efficient jet engines, as well as to promote aeronautics education. “Look at the Ohio quarter," he says, with its picture of the Wright brothers’ airplane and an Apollo astronaut, "one was a hundred years ago, and one was 50 years ago." Sankovic says Ohioans may have pioneered aviation and were among the first in space, but the state has failed to capitalize on subsequent aerospace breakthroughs. He refers to the advanced communications technology developed at NASA Glenn as an example. “You look at all the innovations that have slipped through our fingers,” he laments. 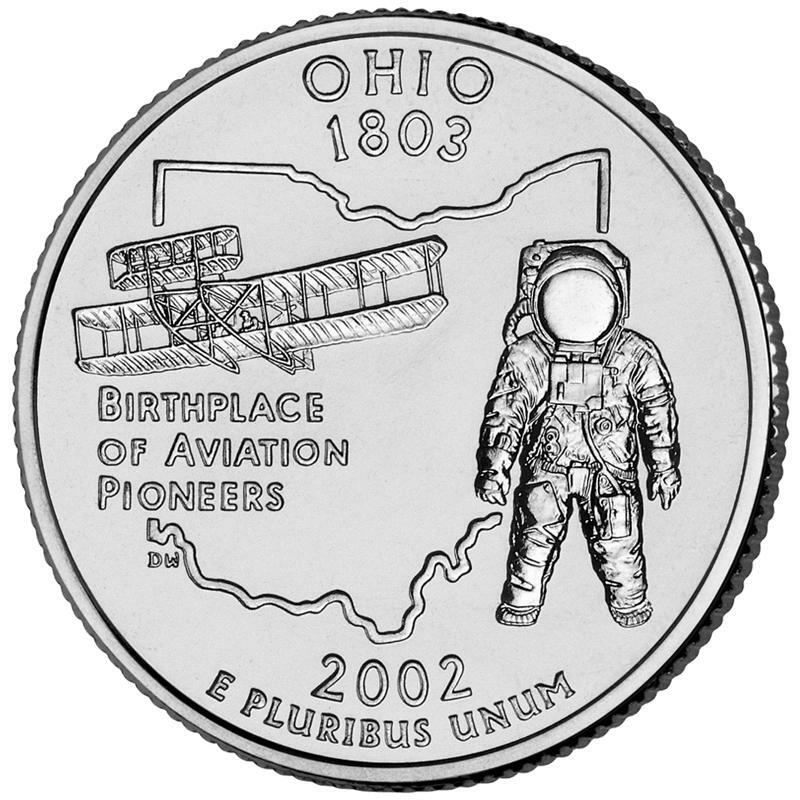 The Ohio commemorative quarter celebrates the state's history as the home to the Wright brothers, John Glenn, Neil Armstrong and other aerospace pioneers. Sankovic says work at federal labs like NASA Glenn and even research at Ohio universities has not made it into the marketplace fast enough. Sankovic also feels leaders in Columbus could do more to help coordinate investments. At the local level, efforts are underway to get aerospace's economic growth off the ground. 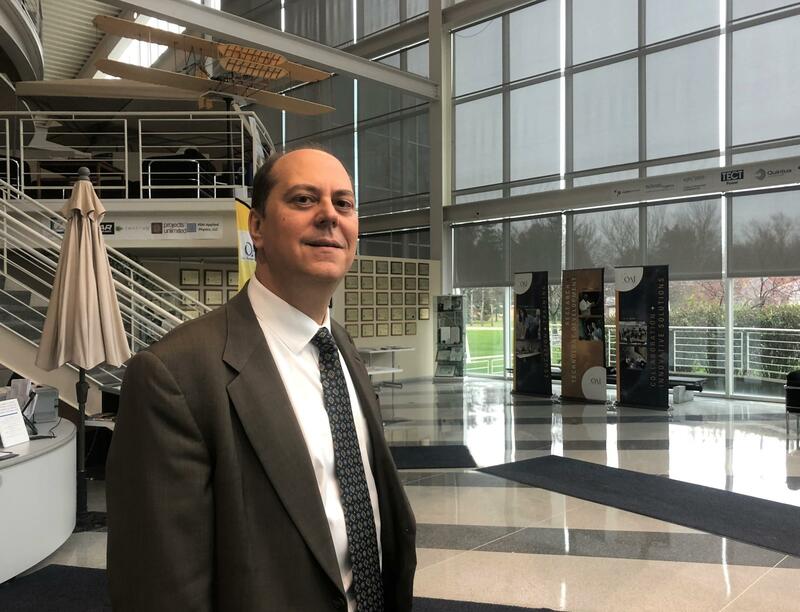 Stuart Mendel is the newly installed director of the Aerozone Alliance, whose goal is to attract businesses to the region surrounding Cleveland Hopkins International Airport. “We’d like to see a district of 50,000 jobs,” says Mendel. The proposed Aerozone business district covers 15 sq. miles surrounding Cleveland Hopkins Airport and overlays five separate cities. That’s more than the current number of 37,000 aerospace jobs in all of Ohio. Part of the challenge for Mendel is bringing together all the players, which includes five cities: Brook Park, Fairview Park, North Olmstead, Berea and Cleveland — plus NASA Glenn, Hopkins and the CEO’s of local aerospace corporations. But he’s got a plan. “The models are University Circle Inc. and Midtown Corridor,” says Mendel. “It’s just a matter of setting a table and inviting people to the table,” he says. Paul Barnhart is an aerospace engineer who teaches at Case Western Reserve University. And he thinks the optimism around Ohio’s potential leadership in aerospace technology is well-grounded. “I think Ohio has a promising future,” says Barnhart. The Ohio Aerospace Institute was designed by Cleveland architect Richard Fleischman. Built in 1994, it symbolizes the spirit of flight. He says the state ranks sixth in the nation in total dollar output in aerospace and defense manufacturing. Back at the Ohio Aerospace Institute, Sankovic reveals another jaw-dropping statistic. Sankovic says Ohio has a mature aerospace industry, but he and others are worried that the birthplace of aviation is losing its place as a cradle of innovation.